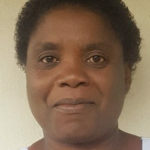 Annie Joabe is a Professional Nurse and Midwife Technician trained at St Luke’s College of Nursing in Zomba, Malawi. Annie has been a research nurse since 2003 at various organisations. In 2014 Annie obtained her certificate of competence in foundational spirometry and developed a love for this work that led to the completion of the European Respiratory Society European Spirometry Driver’s Licence in 2016. Also in 2016 Annie joined the Malawi Liverpool Wellcome Trust in the department of lung health. Annie is a valuable member of the team at Education for Health Africa that quality assures and over-reads spirometry in research for sites across Africa.